Day 1: Marrakech - Ouarzazate - Boumalen Dades (340 km): Departure to the Dades gorges crossing the High Atlas by Tizi n'Tichka (2260m). Visit the kasbah of Telouet in the Ounilla valley and the famous Kasbah of Ait Ben Haddou world heritage by Unesco and lunch. 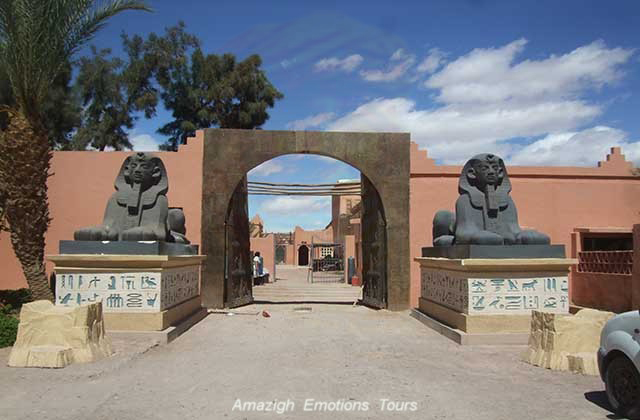 Afternoon, we will stop in the cinema center and Kasbah Taourirt in Ouarzazate. 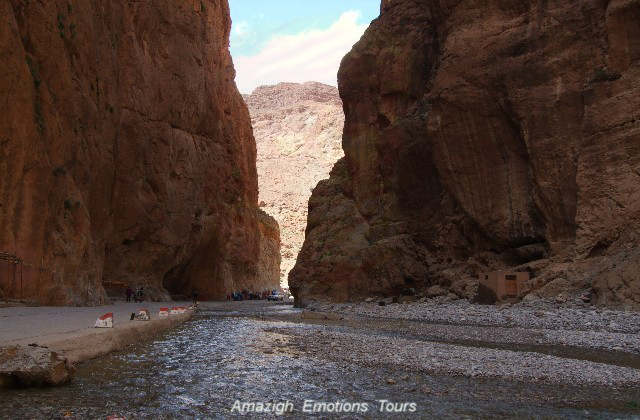 Then we continue on the road of a thousand kasbahs in the valley of roses to Kalaat M'gouna to reach the valley and Dades gorges. Dinner and overnight in a Kasbah Hotel. Day 2: Boumalne Dades - Tinghir - Erfoud - Merzouga (320 km): In the morning after breakfast, we go to Erg Chebbi desert via Erfoud and Tinghir. We visit the Todra valley and gorges, the old irrigation systems (the fouggaras) in Jorf and workshop marble with fossils in Erfoud. 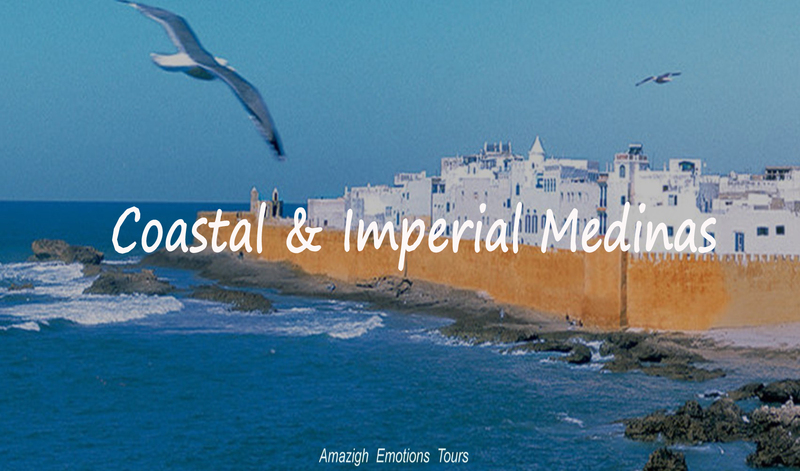 Lunch will be on the road and visit the mausoleum of Moulay Ali Cherif (Alawite dynasty founder) and ksar Abdel Halim. 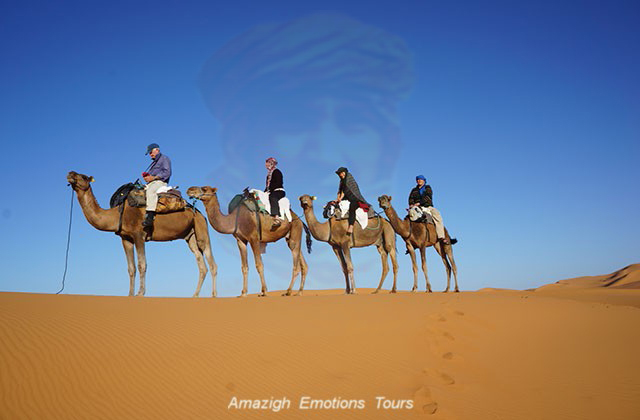 After we will reach the dunes of Merzouga before the departure of your caravan with camels trek for an unforgettable night in the desert camp under the nomad tents. 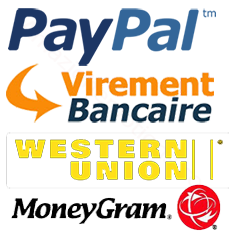 Day 3: Merzouga - Tour de l'Erg Chebbi - Merzouga (120 km track): After breakfast, we will make the grand tour to explore the Saharan life around Merzouga. You cross the temporary salt lakes, black desert with volcanic stones, hamada, sand dunes, temporary rivers, trails Paris-Dakar, nomadic local families, mine Mifis and small oasis villages like Khamlia of Gnawas (blacks of Sudan). The lunch break will be on the road, then back to your home in the late evening and overnight. 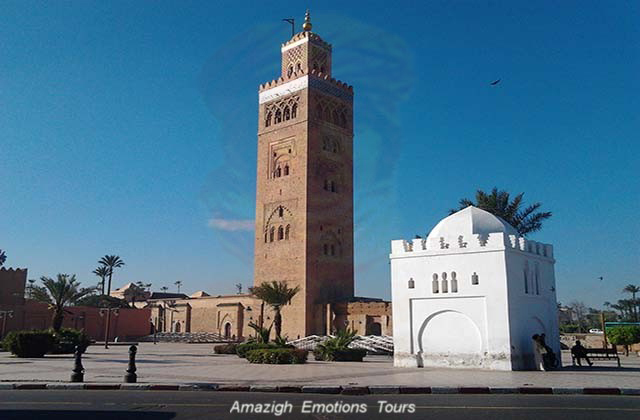 Day 4: Merzouga - Nkoub - Ouarzazate - Marrakech (560 km): After watching the magical sunrise in the heart of desert, you return to take your breakfast on the Hotel. 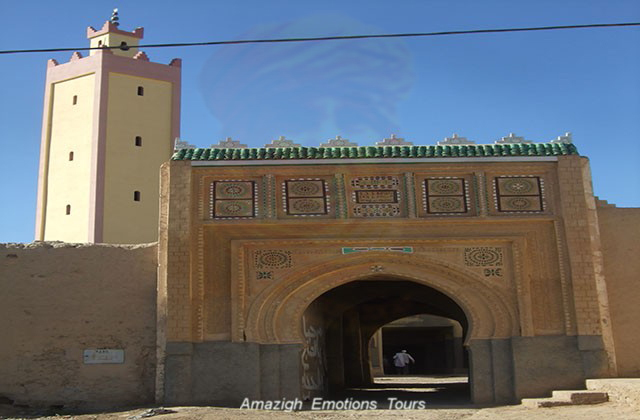 We head to Marrakech through a desertic route via Alnif, Tazzarine, Nkoub to reaching the famous Draa valley and Agdz. 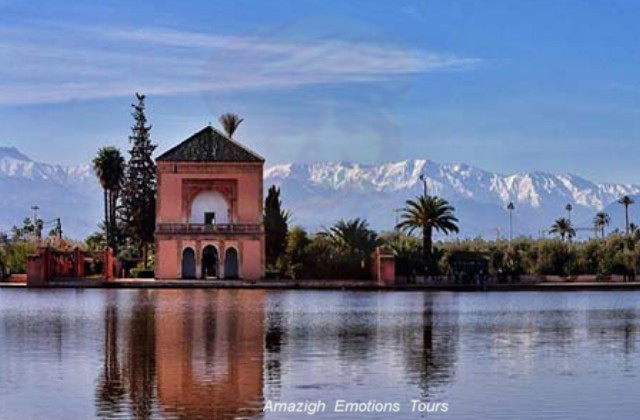 Break lunch in a local restaurant, then continue driving through the Anti-Atlas via Tizi n'Tnififte (1710 m) to reach Ouarzazate and Marrakech in the late evening and end of our tour. Day 1: Marrakech - Ouarzazate - Boumalen Dades (340 km): Early departure to the Dades gorges crossing the High Atlas by Tizi n'Tichka (2260m). 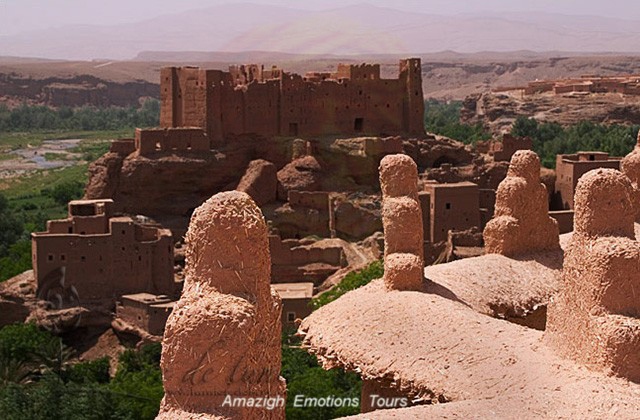 Visit the Kasbah Telouet in the valley of Ounilla and the famous Kasbah of Ait Ben Haddou which is a World Heritage Site by Unesco and lunch. 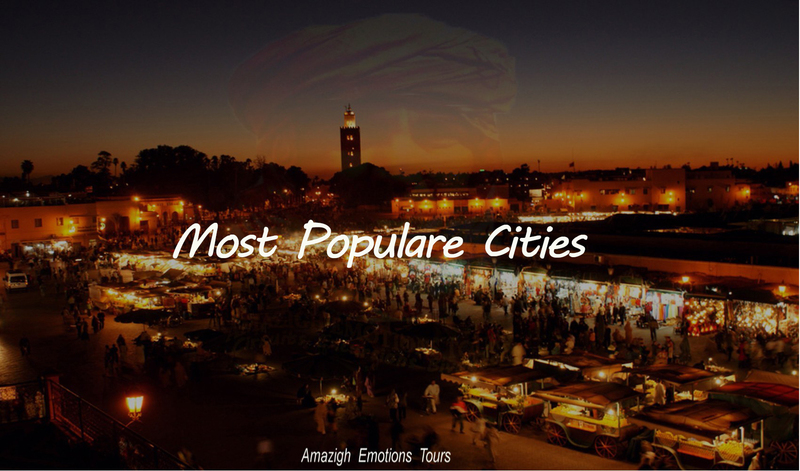 Afternoon, we will stop in the cinema center and Kasbah Taourirt in Ouarzazate. Then we continue by road of a thousand kasbahs in the Valley of Roses at Kalaat M'gouna to reach the valley and Dades gorges. Night in a Kasbah Hotel. Day 2: Boumalne Dades - Tinghir - Erfoud - Merzouga (320 km): In the morning after breakfast, we head to the desert of Merzouga via Erfoud and Tinghir. 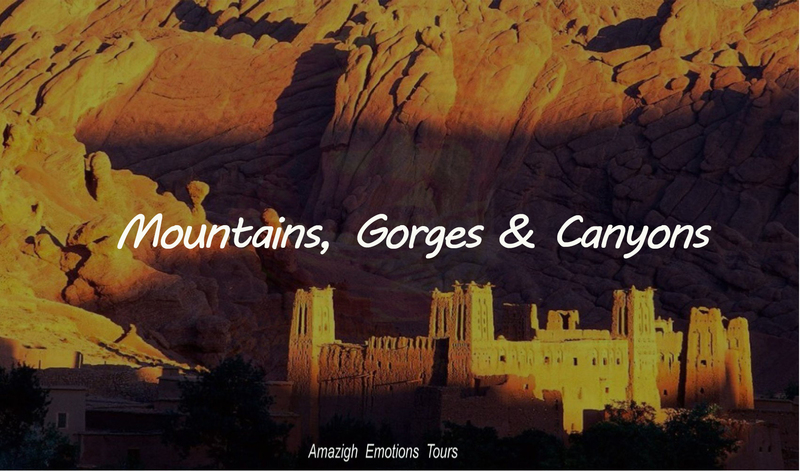 Visit the fascinating Todra valley with its stunning gorges, ancient irrigation systems (the fouggaras) in Jorf and workshop marble and fossils of Erfoud. 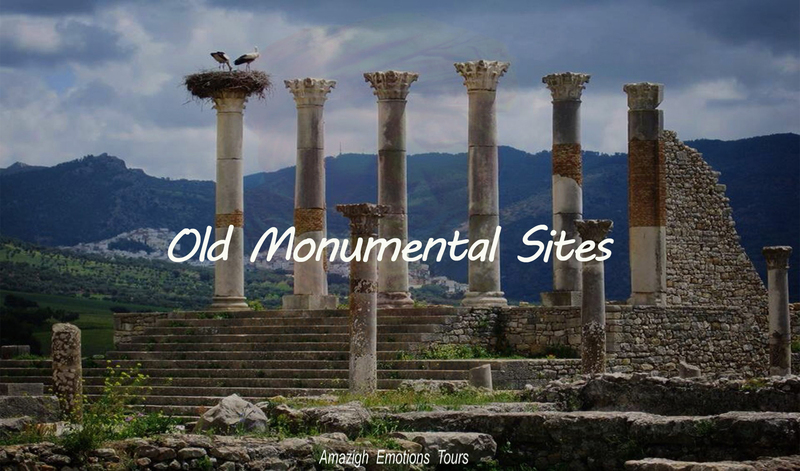 Lunch will be on the road and visit the mausoleum of Rissani (Alawite dynasty founder) and ksar Abdel Halim. 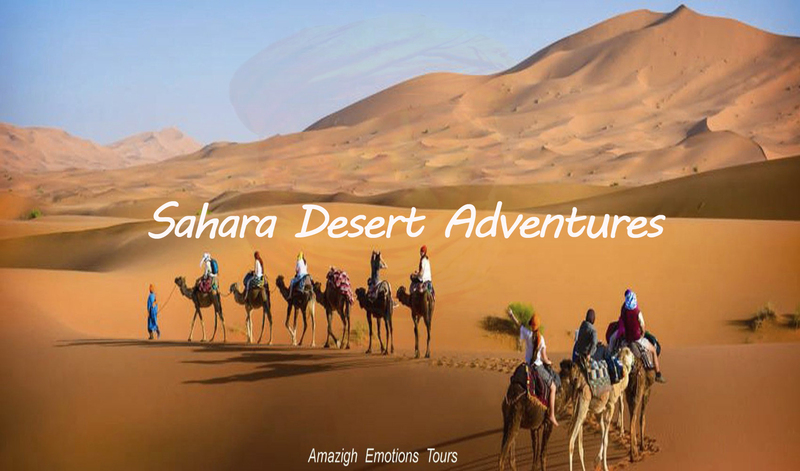 After that we will reach the dunes of Merzouga before the start of your caravans by camels trek for sleeping an unforgettable night in the desert camp under nomad tents. Day 3: Merzouga - Zagora (track 240 km / road 300 km): Early departure to the famous Draa valley to Zagora known with its former departures "Timbuktu 52 days" by the track via Taouz (ancient rock engravings), Maider lake (the lunch break) and Tizi n'Tafilalet exploring the different desert landscapes . Where the road through the small towns of Rissani, Alnif, Tazzarine and Neqoub (lunch break). 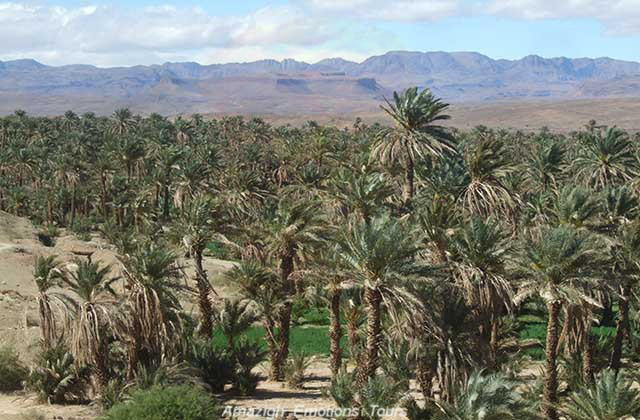 After we descend with the wonders of the valley to reach Zagora. 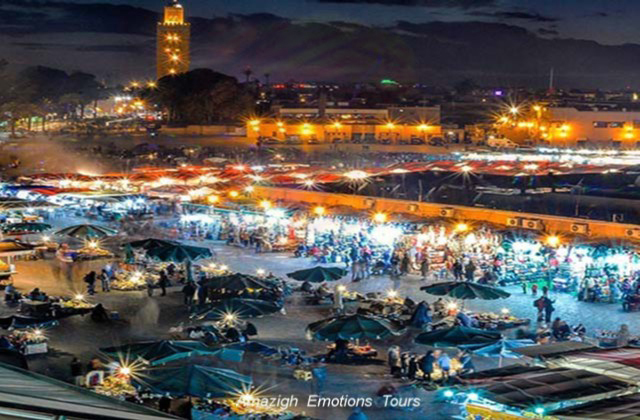 Dinner and overnight at the Kasbah or tents in the private desert camp. 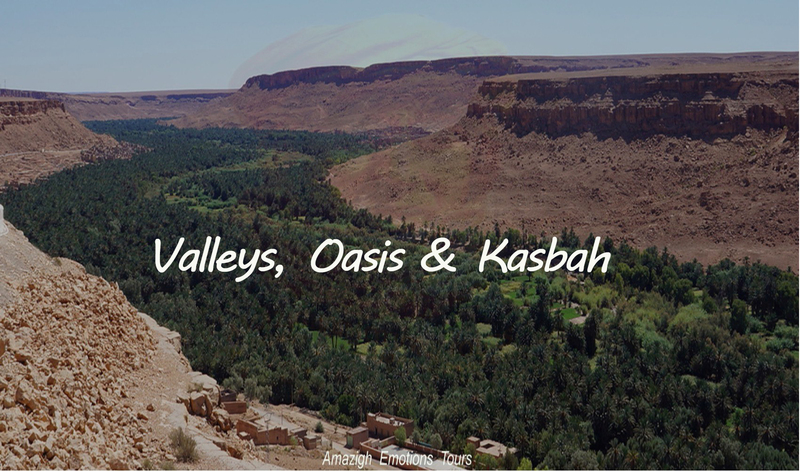 Day 4: Zagora - Ouarzazate - Marrakech (380 km): At 09 am after your breakfast, we go along the fascinating Draa Valley, the Morocco's longest river with its pre-saharan oases and kasbahs. 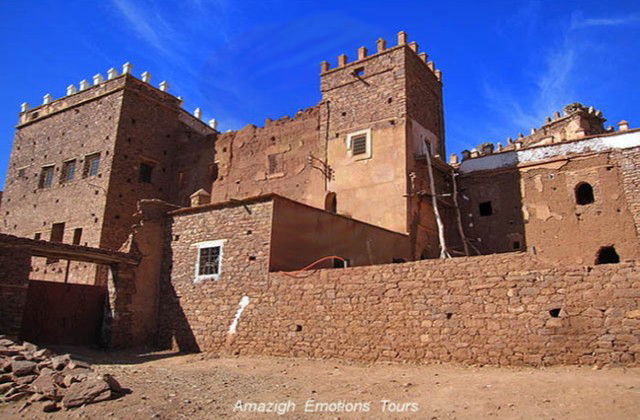 We'll stop to take some wounderful pictures over the valley in the old fort of Agdz (resting place), then we will cross the Anti-Atlas via Tizi n'Tnifift (1660m) to reaching Ouarzazate and lunch. 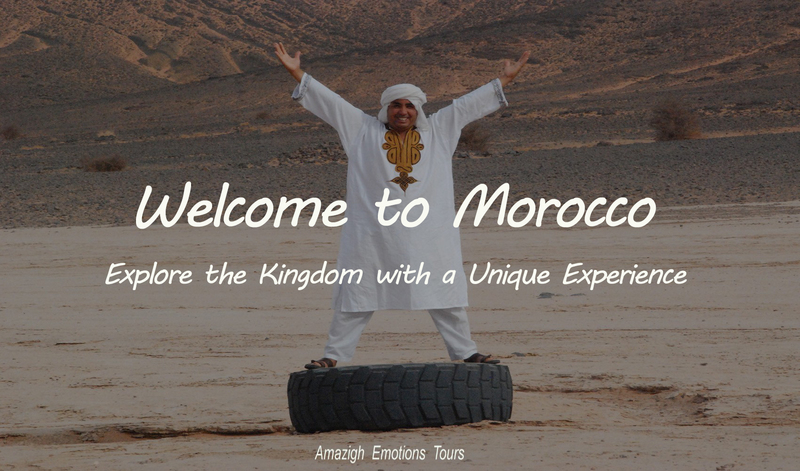 After, we'll continue our road through the berber villages and the High-Atlas mountains to arriving in Marrakech in late evening and end of our travel.